While moored up at Stanton Low I was pinned down by pouring rain and high winds for four days. Without Les I have to relearn how to live on the boat. I am doing the work of two people now, and I am six and half inches shorter than Les was, and my arms are five and half inches shorter (yes we once measured them!) so I simply have to slow down, think things through, try something and discard it if it doesn't work for me. If I am going to stay on this boat then everything on it must work for me now. One of the things I definitely will not do is attempt to move an eighteen ton, fifty eight foot steel boat in high winds! As I sat peering out the windows through the rain, an amazing array of boats passed--all on their way to the Crick Boat show taking place this weekend on the Leicester Arm. One gloomy rain sodden morning I looked up to see the bow of a boat moving very slowly past. It was the most unusual color of blue and then I was struck by the thought, "What a minute! I know that blue!" As the stern passed me, I poked my head out the window and hollered at the figure dressed in rain gear with an umbrella in hand, "Hey you!" It was James and Doug on NB Chance, headed to Crick to sell their boat. They were looking for me but of course, NB Valerie is traveling incognito these days with half a paint job and no sign writing declaring her name. James quickly pulled over in front of me and moored up, and came to hold an umbrella for me so I could cross to their boat for a cuppa and piece of cake. We spent an hour catching up and it was lovely to see them both, especially since they will soon no longer be cruising the cut in their distinctively blue colored boat. It is up for sale and a new chapter will soon begin for them both. I had the pleasure of watching a Heron catch breakfast; a fish too wide for it to get down its gullet, despite several attempts. It finally left the fish and flew away. James at the helm and Doug warm and snug inside, cruising off to Crick in the rain! "Throw me a windlass and I will lock up up." YES!! As the lock filled and NB Valerie rose I chatted with him. In his late 70's with bad knees, he found it necessary to take a permanent mooring last year. I thanked him as I cruised out of the lock and headed for the other water point about five hundred feet from the top of the lock. Another boat was already there but they saw me hovering and invited me to breast up with them so I did. They were almost finished and we did a lovely little dance with our midlines, as we switched places; they gently cruised away and I pulled our boat in to the side. Les took this video in 2015 of the railroad mural coming in to Wolverton. Looking back as I cruise across the first aquaduct. The water point below Cosgrove lock here, is just out of site on the right. With a boat moored up on these bollards, you can see how impossible it is to tie up the boat, go up and set the lock, open the gate, jump back on board, steer the boat gently into the lock while stepping off with the midline and controlling it as the boat goes in the lock. There is no place to tie up when a boat is on the bollards getting water. This is why I prefer to get water above the lock at the facilities there. "Hi Rick I am Jaqueline but most folks call me Jaq." We chatted with one another for the thirty minutes it took to fill my tank. His partner Tim was holding down the stern. 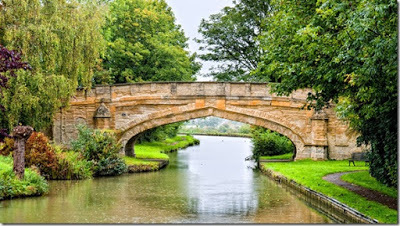 We would both be mooring up near the ornate Solomon's bridge just ahead, giving us an opportunity to speak more later. I cruised slowly off to moor up and their boat NB Dunrushin, slipped into my place. I pulled in to the towpath before the bridge, slowed down to a near standstill, grabbed the midline, stepped off into the grass and pulled the boat in to the side. After mooring up, I put up the TV antennae, checked the phone and Internet signals (good), and settled in. Soon Tim and Rick pulled in two boat lengths behind me and moored up. Sorted! Solomon's Bridge at Cosgrove. NB Valerie is moored up on the right behind me. We have eight posts about Cosgrove in our blog--most of them written by Les. I was hot and suddenly realized I was starving, having had no breakfast before leaving Stanton Low three hours previously. I grabbed a quick hot shower, changed my clothes and made the decision to have lunch at the Barley Mow Pub. It was a tough thing to do as the last time we were here in July of 2016 Les and I had a drink in the pub. We knew it was his final drink at the Barley Mow and the last time he would set eyes on the beautiful bridge. It was a melancholy, somber evening for us both as we recalled the times perviously when we moored in the same spot and ordered groceries from Tesco which delivered them to our boat at the bridge. We walked back to NBV hand in had in the gathering dusk and sat on the bow watching bats dodge and dart in the darkness, our arms around each other. I wore my sunglasses and took a Kindle to read while I waited in the pub for my meal. I did everything I could think of to keep from breaking down and crying. There are times when I don't care and other times when I just have to wait until I am alone to let the tears fall. I am swept along on this grief journey like flotsam and jetsam caught in a tidal pull that rips and ebbs at awkward moments. I can be perfectly fine one moment and then suddenly overcome with memory and longing which completely undoes me. I don't seek to control this grief because I quite simply cannot control it. These emotions are so intense, so huge; they are far larger than my little body can contain and my grief breaks through suddenly, overwhelming me. I decided to stay in Cosgrove until Monday as my step-son Kevin and his partner Adele were coming to visit. I put in a Tesco order and an Ocado order! I've never ordered from Ocado before but I really appreciated being able to get some things from Waitrose and some American items that I usually have to purchase online from the States and then pay VAT as well. One would think with Scotland as part of the U.K., it being the land of Oats, it might be a simple thing to find steel cut oats in any grocery store but no, I have found them in one place in six years and that is a deli near Sanbach on the Trent & Mersey canal. Ocado offered them and I bought two bags to stock up with a happy heart. Kev and Adele came to me on Sunday and we had a lovely afternoon. It was so good to see them both and to sit and talk. They brought me several parcels: the set of replacement fire bricks I ordered, stern gland grease and a package from my daughter Jesse in the States. They were also kind enough to take a few hefty things away for storage: our large suitcases, a tile cutter, the large piece of mattress that allows one to make the bed into a cross bed six foot by six foot; and some gifts for them including several of Les' large coffee table books, some other items I set aside for them, and some items I picked up for them from Boo Radleys in Spokane. Boo's is an eclectic store named after the character in the book to Kill a Mockingbird who collected strange eccentric items. It is that kind of store where you can indulge your inner child to your heart's content without censoring; things like the magnet now on our fridge which has a picture of a turtle with a snail riding on its back and says, "Whoa!! Slow the F**k down!" --perfect for a narrow boat home that travels mostly at 1-2 MPH. I knew Les would have loved it. I also brought back two boxes of Graham Crackers for Kev and Adele. Angel Bars are Kev's favorite and one really must have Graham Cracker crumbs to make them properly. A lovely boat named Kallista pulled in front of me and moored up closer to the bridge Thursday afternoon. While waiting for my grocery orders I had an opportunity to chat with the very nice bloke aboard, named Chris. Kallista is a share boat and he has owned his share for four years. This is a nice boat built by Elton Moss boat builders. Chris and his Labrador Charlie were waiting for Chris' girlfriend Kristy to join them for the weekend. Chris' share boat. He told me he pays less than the cost of hiring a narrow boat for a one week holiday and he gets four weeks a year. My American friends and family may want to consider this option in lieu of purchasing a boat of your own. It is like owning a Condo. Monday dawned bright and cool, quickly warming up as the day moved forward. Rick and Tim kindly offered to travel up the Stoke Bruerne flight with me so I didn't have to do the locks on my own. They were ahead of me as we took off and soon we came to a Wyvern shipping hire boat in trouble. Two women aboard had managed with a bit of help from the light breeze I suspect, to end up aground on the off-side of the cut. Tim and Rick towed them out and we proceeded onward. As we reached Grafton Regis I lost site of NB Dunrushin. I had to slow down. Les and I moored in this area so many times over the past six years and one spot in particular, just past past bridge 57 and just around the bend from the weir, where the fields open out across a long vista. On the offside a gentle hill brings grazing sheep down near the cut. Les often tried to get a spot here and it was usually full. We managed once in six years and he was ecstatic. I thought back to the summer of 2014 when we moored up on the other side of the bridge and walked up the lane to the village of Grafton Regis. Small, medieval, it was easily walked in ten minutes. It was blackberry time; I didn't call Les Blackberry Biggs for nothin'! We picked until we had seven pound of berries. We also met up with Marilyn and David Macdonald on NB Waka Huia there in September of 2014 for the very first time, and in 2015 we finally met boater Mortimer Bones there as well. Tears poured down my cheeks and I sobbed until I had the hiccoughs and couldn't see. I pulled the boat over and took time to recover my composure. Then I grabbed my kit from the bow, dug a hole near the fence overlooking the field, scattered some of Les' ashes and planted a Daffodil bulb. Now a part of him will always have a mooring space in one of his favorite spots. Les' ashes are scattered just near the middle post. A lovely double Daffodil will bloom here next spring. "Why did you do that? I was closest to the bridge hole and you stopped!" "I think you'll find I was the closest to the bridge hole and you should have given way." "I would gladly have given way if you had signaled your intentions to me." Off he went muttering to himself--and other boaters behind who witnessed it all--about boating being a contact sport after all. A little further on another line of permanently moored boats appeared and stretched like long jeweled beads around a curve in the cut. There was a ton of overhanging vegetation and trees on the offside obscuring the view, so I took it slowly, suddenly spotting the bow of a replica working boat cruising along on the other side of the veg, blissfully unaware of my approach. I sounded my horn and he slowed right down. As it was he nearly pushed me into the line of moored boats, apologizing as he passed. "Sorry about that. I was day dreaming. Thanks for sounding your horn." All righty then! Soon enough I caught up to Tim and Rick at the service point at the bottom of the Stoke Bruerne flight. We both filled with water while waiting for a pair to go up and another pair to come down the flight; then it was our turn. Up we went and eventually we made to the top. I moored up in the last space before the mouth of the Blisworth tunnel and they moored up behind me. Hot, tired, and emotionally exhausted, I decided to try the steak and wine dinner advertised at the Navigation pub back below the top lock. I showered, changed clothes and walked down to dinner. I ordered a Sirloin steak but what was brought to me was a rump steak. The waitress tried to argue with me about the cut and I said, "I know what a Sirloin cut looks like, and I am well aware of what rump steak is. I ordered a Sirloin steak medium rare and this is a rump steak nearly well done." So she took it back and brought me a Sirloin steak medium rare but by then I had little appetite for it, the broiled mushroom, partially broiled tomato and limp clump of rocket on my plate. I had to ask for the dressed salad I had also ordered and it came, drowned in olive oil and nothing else. This is not a pub I would recommend to anyone for a decent meal. The young women staffing the bar really didn't seem to give a fig about food service. Back on the boat I found I had no Internet, telly or phone signal; not surprising given I was moored up at the deep end of a cutting with a 3057 yard tunnel in front of me. I decided to call it a night and went to bed early. I slept restlessly waking after three hours and was up the remainder of the night. The next morning Dunrushin was off into the tunnel, Tim and Rick waving goodbye. Their boat will be up for sale soon. They are headed for Crick along with so many others, to have their boat evaluated. Tim and Rick beside their sweet boat NB Dunrushin. I decided to visit the canal museum above the top lock and as I walked back that way I spotted NB Morning Mist, Kate Saffin's boat, with working boat Tench moored behind her. I stopped to chat with Kate and Heather Boyce. They are involved with Alarum Theatre's production of Idle Women:Recreating the Journey which tells the story of how women were recruited to run the working boats on the cut throughout World War II. I had a lovely chat with them, and Kate gave me some well founded ideas about managing the boat and locks as a single handed boater. Many thanks Kate. This morning I was up at 5:30 after a decent night's sleep. I emptied the engine hold of water (yes it is still leaking), greased the stern gland again, tidied up the engine hold, put on Les' rain gear, slid the tiller and pin in place and cruised off into the Stygian blackness of the Blisworth tunnel. At 3057 yards it is the third longest tunnel on the canal system. It is just wide enough for two 7 foot wide narrow boats to pass. I have very poor depth perception and very useless spatial awareness. As I was bringing Les and the boat back down to Tring last July, I entered the tunnel in the afternoon going from brilliant sunlight to complete darkness bar the tunnel light on the bow. I rammed into the side of the tunnel and broke a navigation light. This time I decided to leave just after dawn so there would not be so much difference in the light outside the tunnel versus inside. I also would not meet any boats coming in the opposite direction at crack-thirty in the morning. It was dark, wet with water cascading down in continual drips from the ceiling, musty smelling and I had it all to myself. I also turned on all the interior lights before I upped pins so that the walls of the tunnel were illuminated the length of the boat and not just at the bow. Thirty minutes later I emerged into a golden sunlit morning. The world was just waking and I had the cut to myself. 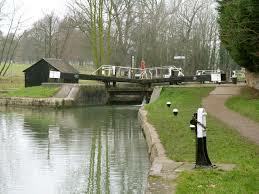 I stealthily cruised through Blisworth, on to Gayton Junction and passed the long line of moored boats there. Two and half hours after I started I was mooring up across the cut from the farm with the horses just past Bridge 45 which takes one up to the village of Gayton. I stopped here because this is also a favored spot of Les'. We went Scrumping in Gayton and we began painting the boat here in 2014 when we thought all was well and Les was going to survive his cancer journey. 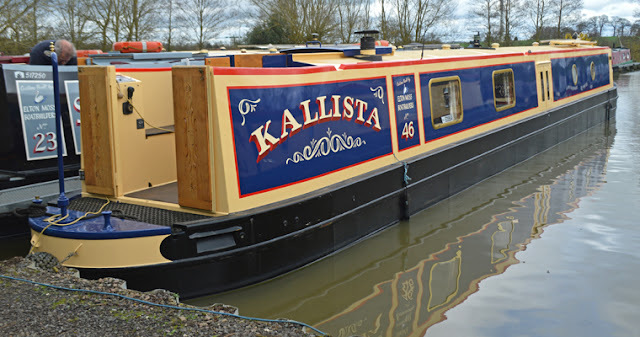 As I sat here typing this blog NB Kallista went by, Chris at the helm in the sunshine. He typifies Mo on NB Balmaha who once said, "Aren't boaters lovely?" Yes they are indeed. Every time I meet a new boater and I am touched by their kindness, I think of Mo and he springs back to life again for a moment. We lost him to cancer too soon as well. A few minutes later I heard the toot of a boat horn and NB Briar Rose cruised past, Adam and Adrian on the stern waving madly at me. They too are off to the Crick boat show and said they will no doubt see me on the way back. Something else to look forward to then! Must get a pan of Brownies in the oven. Last night at dusk I took a walk to scatter more of Les' ashes and plant another Daffodil. He died four months ago yesterday; 16 weeks, seven hours and thirty minutes ago. His ashes are scattered and a Daffodil planted in between the large oak tree and the short post declaring the hazard of overhead power lines. Easts Bridge no. 44 is in the distance. The clump of Daffodils marking Les' ashes near the Oak tree. The view across the cut from Les' ashes. He loved all animals--especially horses. He also loved mooring here in the quiet of the countryside with the farm across the way. NB Valerie moored up across from the farm near Gayton. Wrights Lane Bridge No. 45 is in the distance. Back in early March I set off on a trip back to the States. I needed to answer the question, "Where is home?" I hate to travel by plane. I develop motion sickness easily. I suffered from it as a kid in automobiles, on escalators, elevators, Ferris Wheel, merry-go-rounds and even swings. So you can imagine my horror of traveling by plane. Add to this my need to maintain control over me and my immediate space, and the appalling manner in which airlines treat paying customers and it really is a recipe for acute tension and anxiety at the very least. Finally, I used to clean airplanes for a living and at one point I was trained to search for bombs on board planes. I know way too much about what goes on behind the scenes to be comfortable with current airport safety procedures. Add to this the fact that I am an emotional empath. I have been able to pick up and read the emotions of people around me since I was very small. This is the main reason I hate crowds; too much energy swirling around--a lot of it negative and ungoverned by the people generating it. Airports are vortices of human energy. If I have to go out to a crowded place I have to shield myself and this takes an immense of amount of energy to maintain for any lengthy amount of time. This trip back to America required I fly out of Heathrow--Europe's busiest airport and one that is huge and spread out. I was terrified I would not be able to find the actual gate, given that I am dyslexic and the more stressed I am, the more pronounced my symptoms become. Numbers and letters transpose themselves. I lose my peripheral vision and my hearing drops in and out. Les had been dead six weeks and I was a stew of overwhelming emotions, sleeping two to four hours a night maximum, and my new right knee was only four months along in the healing process. I made sure to get to Terminal 5 early--about three hours early. I checked in, checked my bags through with assistance from airport personnel, and made my way to a restaurant to put some decent food in my stomach far enough out from the actual flight that it would have no chance of coming back up again. As I sat waiting for my meal to arrive, a woman was escorted to the table next to me. We began to chat and I discovered her name is Marie and she is a retired teacher. She travels a fair bit, lives in London and has an amazing bucket list blog. Her blog title says it all very succinctly: After60--thenext10: The bucket lists have been written. How much can be achieved in the next 10 years - from the mundane (baking an edible cake) to the ridiculous (kayaking through the rain forest). Marie's company during lunch helped me to forget my anxiety and focus on something and someone else. She is interesting and funny, and I like how she divides her list up by tabs labeled, "Around London," "Around the UK," "Around the World," "Around Home." Within each tab are Marie's lists and those she has accomplished are indicated in red print and some have links to her posts about her experiences. She has visited the London Bank of England museum and lifted a gold bar worth £144,000, taken a tour of Lloyd's of London, gone fossil hunting on the Jurassic coast in Dorset, and visited the Holy Island of Lindisfarne. Marie's blog is a great resource if one is looking for new things to find, do, and experience. For example her visit to the Hunterian Museum provides a link to the London Museums of Health and Medicine site offering links to twenty four different museums in London all having to do with health and medicine. Marie visited the old Roman Baths in the town of Bath and then went one better; she booked in for the Twilight Package at Thermae Bath Spa which uses the same waters as the Roman baths. I checked out their web site and WOW! The prices are amazingly reasonable and you get a lot for your money. I have now added this item to my bucket list! Marie has climbed a volcano in the Galapagos Islands, traveled through the rain forest canopy along a zip wire in Costa Rica, visited the top of the Empire State Building in New York, and climbed to the to of the Sydney Harbour Bridge in Australia, visited Uluru (Ayers Rock), and sat on the back of an alligator in the Florida Everglades! Closer to home his intrepid explorer has conquered more mundane goals: worked as a volunteer at the London Olympics, swam a Km doing the front crawl, tried Zumba and baked an edible cake! Marie still has loads of goals left to complete on her bucket lists and I look forward with great relish to reading about them as she does. Earlier the first week of May I met with fellow boat woman and herbalist Kit Acott. She came aboard and we talked over tea. It was such a blessing to share time with another herbalist. I haven't done that in over twenty years. Kit shared some great ideas with me and her presence filled my soul with peace. Thank you Kit!! Gift number one. Saturday, May 6th brought a visit from friends Sue and Ken Deveson of NB Cleddau. They came bearing beautiful flowers and amazing cookies! We had a wonderful visit as always, sharing our mutual love of the waterways. I was deeply blessed by their love, encouragement and assistance in the days and weeks after Les died and I so appreciate their still looking out for me now. Gift number two. Later that evening our friend Angela Walsh of Berkhamsted and NB Bright Eyes texted me to say she was moving up to Fenny Stratford. I locked her through Fenny stop lock and the pedestrian bridge and she moored up behind me. Then she swept me away to Soulbury Three Locks pub and treated me to a fabulous steak dinner, several hours of deep, wonderful and funny conversation, and finally we returned to our boats to sleep. Sunday morning before I cruised off, Ang and I shared breakfast aboard NB Valerie. Gift number three. I cruised up to Pear Tree bridge and waited for forty minutes while a boat filled up with water. I could have been filling as well but a wide beam was sitting on the water point moorings. They filled their tank and two water butties installed in the bow on either side of the bow doors after which they took off in their car and left the boat moored up in everyone's way all day. I was desperate for water having been moored up and broken down at Fenny for two weeks with a non-functioning water point. I filled my tank and washed two loads as I went along in the Sunday afternoon warmth. I fetched up at Campbell Park in Milton Keynes and managed to score a mooring spot on the offside near the park parking lot. The link above is to a blog post for May 29th 2015 when Les and I met our daughter-in-law and grand kids Kiera and Kiernan at the park and spent the day cruising. It is one of those beauty spots with great access to buses, Central Milton Keynes (CMK) shopping, the rail station and post office; gift number four. I had business to conduct in CMK to whit, I needed to have Les' name removed from our bank accounts and it is no easy thing to accomplish over here. Most banks require an appointment with a bereavement advisor and they are apparently as rare as hen's teeth. I had to cancel the appointments booked before I left for the States in March, because they ended up being on the same day the River Canal Rescue marine engineer showed up last week to make repairs. I tried to reschedule with the banks over the phone and broke down sobbing and hung up. So off I went Monday, May 8th to beard the lions in their dens. Nationwide was fabulous. I explained the situation and simply said I was not leaving until I had this sorted. Within ten minutes a lovely young woman called me and shortly afterward the deed was done. It felt so strange taking Les' name off of an account that was his to begin with. It was necessary to keep our account from being vulnerable to hacking through his log-in and it is also a legal necessity but it feels like I requested that my Best Beloved be erased from our finances. It was tough to do...so I moved on to Halifax and they were asses to be plain. I waited at the information desk for twenty minutes before anyone came to see what I wanted. I was told that I quite simply HAD to speak with a bereavement advisor and one was not available until the following Tuesday afternoon. I left and went back to Nationwide and spoke with the young woman who kindly assisted me earlier. It turns out she could help me close out the Halifax account and switch all of our standing orders and monthly debits and payments to the Nationwide account. Sorted! It was Halifax that required six different visits and six months before we managed to get my name added to Les' account and then they still screwed it up, froze the account, and we had to go back in again to get it sorted out although it was their error, leading to my calling it Halif**ked up much to Les' amusement. What a relief to never have to do business with them again. Gift number five. Back on the boat I started fixing dinner and turned the engine on for hot water and a woman on the boat behind me waved and called out to me. It was Fran and her husband Vic on Wide Beam (WB) Moonstone. We had never met but we knew each other from boater's forums. Lovely to meet at last! 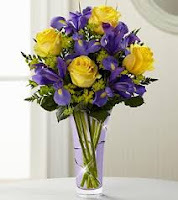 Gift number six. When I cruised in to Campbell Park I passed the trading boat Tea Junction owned by Tracey and Ray Arbon, and their residential boat Billy Whizz. Tracey was out and about on her bike and she stopped in on Tuesday afternoon for a cup of tea and a natter. Les and I first met Tracey up on the Bridgewater canal back in 2012. We had a good long chat and reminisced about Les with tears and smiles. I am so appreciative of those who do this with me as it helps to keep Les' memory alive. Later Tracey stopped by again while out walking her dogs and dropped off a luscious parcel of Victoria sponge cake! Yumm!! Gift number seven. The moorings at Campbell Park are only for two days, so Wednesday morning I cruised off at 8:30 am. It was cold and overcast until the clouds parted an hour later and the sun finally made its appearance. After catching up seven loads of laundry and cleaning the boat I needed water again so I pulled in to Gifford Park where I waited while NB Daedalus filled up. I chatted with her owners Pat and Simon. Lovely folks they are, who have lived aboard for eleven years. We exchanged email addresses before parting. Gift number eight. There was no room at Linford Park so I cruised on and moored up at one of the most breathtakingly lovely places around--Stanton Low. Les first brought me here in 2011. We moored here for three days and saw not another soul. I wrote an historical post about this spot which you can read here: at that time the estate of Princess Diana's family, the Spencers, owned the land on either side of the canal. Interest in saving the the nearby 12th century church ruins generated interest in my blog post which led a local group in turn to contact the Spencer family about the land. Diana's brother, Lord Althorp, looked into it and agreed to sell both parcels to the Milton Keynes County Council with the proviso the land was left as a park and not built on. Now there is a park on both sides of the cut with a nature sanctuary behind the church ruins. The views panning to the right from Les' daffodil across the field towards the 12th century church ruins at Stanton Low. Beyond the tree line is a lake with an island. It is part of the wildlife sanctuary. Herons, Egrets, and Comorants all nest there in the spring. The path leading from the bridge near Les' Daffodil. Turn left at the bottom and it leads out to the towpath. The fields are enclosed now to keep motorbikes and ATV's from riding across them. In the dusk one can watch Barn Owls hunting the fields. The church ruins used to be inaccessible. Now one can walk through them and there are information boards telling about the history of the village of Stantone/Stantonebury/Stanton Lowe. The village appears in the Domesday Book of 1066. There was a mill and four cottages here at the time. The church and the footprint of a manor house are all that remain now. I heard cuckoos calling out across the meadow! The clocks really do sound just like these birds. It is a tad strange to hear their call from the woods when one is used to hearing it from a clock on the wall! Five Greylag Geese and nineteen babies! NB Valerie moored up at Stanton Low. The church ruins are just out of site to the right across the fields. The canal bridge is behind me and the park leading up to the Oakridge Park housing estate is across the bridge and off the right. On the off side over the old hump-backed canal bridge and up through the park on that side is one of the best designed and built housing estates I've ever seen in this country. A pea gravel path takes one from the canal, through the park and in between the houses on the estate. A right turn on Selkirk Lane brings one around to a new ASDA store and a bus stop. The bus comes every fifteen minutes going into Central Milton Keynes or five minutes down the road to Wolverton Tesco. Despite the close proximity of the housing estate, it is fairly quiet here but no longer empty most times so I was lucky to get a spot. Gift number nine. Wednesday, May 10th brought warmer weather with blustery winds moving the clouds along quickly. It also brought a short visit from Sue an Ken Deveson again. After hearing of my travails down the weed hatch with a bread knife back at Grove lock, Ken thoughtfully went online and ordered a curved knife with a locking blade for me and they stopped by to drop it off! Gift number ten. Thursday evening brought a lovely sunset and a knock on the boat. It was our dear friends Robert Rogers and his sister Maria! Robert used to own WB Wind in the Willows. He sold his boat and followed his heart to another country as did I, to marry his Best Beloved Roseni and make a new home in Brazil. Robert returns to the U.K. a couple times a year and he always finds us wherever we are moored. They came aboard with so many lovely things for me: a beautiful gray scarf covered in butterflies, a loaf of freshly bake Irish soda bread direct from Ireland, a box of ginger cookies and a lovely planter with miniature yellow roses. We drank tea, reminisced about Les through tears and laughter, and walked out to the canal bridge to enjoy the beauty of this favored spot. It was such a joy to spend time with you both. Gift number eleven. Friday, May 12th arrived at last and brought with it a long anticipated visit from our friends Sally and Joe Horton who live in Pullman, Washington. Sally is Scottish and Joe is American. They have been married for forty years and we are blessed to call them friends. We have shared delicious meals and evenings filled with fascinating conversation accompanied by Joe's Grand Seville cocktails and home smoked Steelhead Trout. This is the third time they have visited our boat. More reminiscing took place over lunch after which we took a walk to the church ruins and along the path to view the birds nesting in the sanctuary. Gift number twelve. Finally yesterday in the last rays of the evening sun I scattered some of Les' ashes and planted a Daffodil near the canal bridge where we used to stand and survey the view across the fields toward the church ruins. The last time we were here we watched barn owls quartering the fields for food, gliding silently over the meadows in the gathering dusk. This led me to recite the poem by E.E. Cummings that I included in Les' eulogy which says, "I carry your heart with me (I carry it in mine)..."
What does it mean to carry someone in one's heart? This pendant has Les' ashes inside; a gift from daughter Sparky. is an activity. No mere jargon or jingoistic words of grief to pause on and forget; carrying Les in my heart means I move through my life with a continued relationship with him. He may be dis-incarnate but he is not gone. Carrying him in my heart requires me to move through my grief and re-member our relationship. I had a statement engraved on Les' wedding ring: "You are my joy." He was, he is, and he will always be my joy. Yes I am sad Les is not here on an incarnate level to continue sharing life with me but without his diseased broken body, Les' soul can rise with joy, move at the speed of thought, create paradise and touch my soul--and my Beloved is no longer subject to the laws of gravity and physical being; no more illness, no more pain, no more slogging through this world wearing heavy clay boots. I am sad for myself but I can no longer be sad for Les. Our relationship continues re-framed: my heart is the sacred space where we come together again as one in a new method of engagement. and when life was dark. When you told me, and even when you didn't. RCR have come and gone at last; ME Tom replaced the bilge pump hose and showed me how to grease the stern gland. It is an easy thing to do if you know how. I am not someone who can learn how to do manual things by watching a video or attempting to make sense of Chinese drawings without written instructions. Now I have one tube of the proper stern gland grease and two more ordered from RCR as back up. Now I know to grease the stern gland every 200-300 hours on the engine and I will attend to it zealously! Now I know I have a complete set of stern gland seals all ready to go on if need be. For now the boat is sorted. 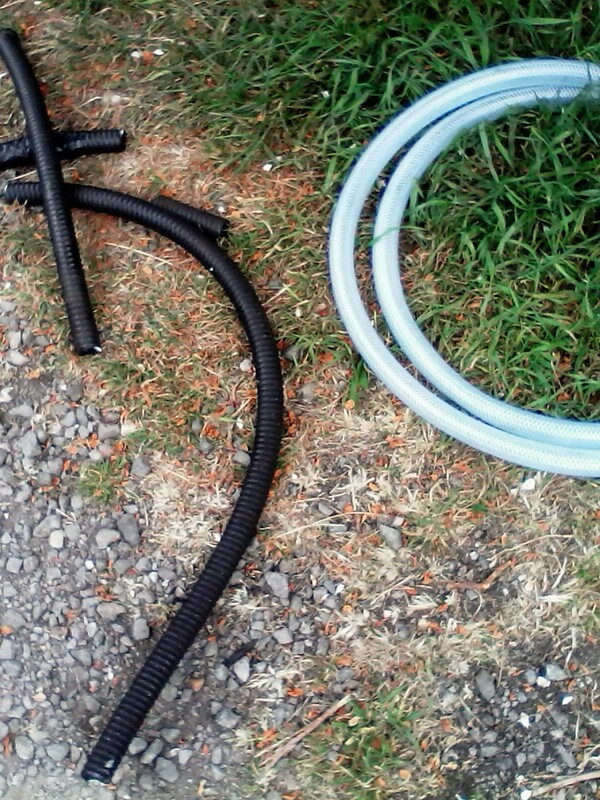 On the left is the cracked, cheap plastic electrical conduit a certain Cowroast ME used to replace my bilge pump hose. It didn't even hold for a week! On the right, the proper sturdy hose required and fitted by the RCR Marine Engineer, similar to what was originally fitted on our boat. 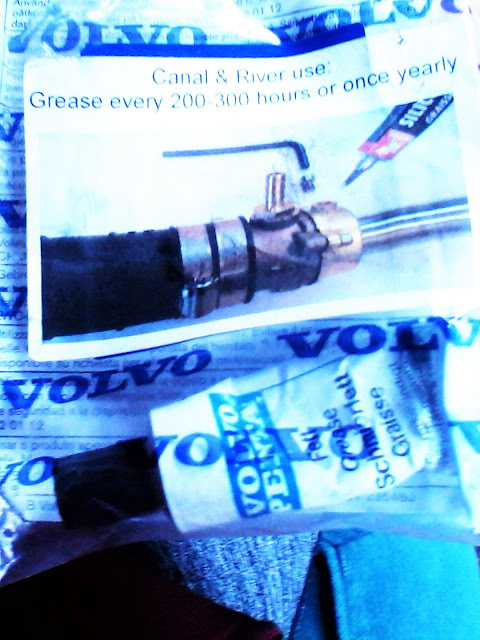 The package from RCR with the proper stern gland grease and a picture illustrating perfectly how and where to apply it. and the opening of the tube of silicone grease Les had last used for this job. 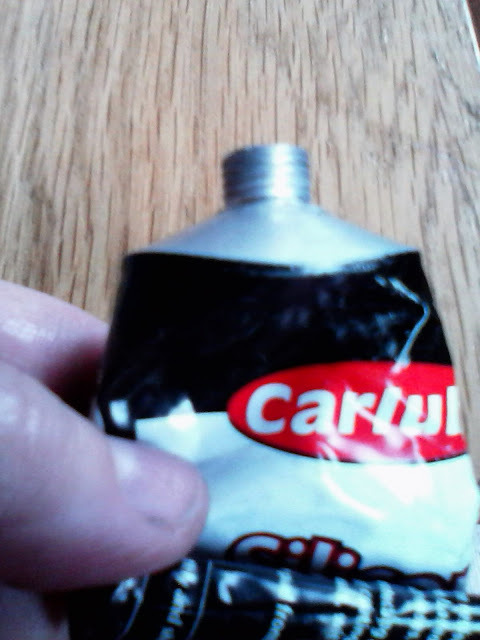 I have no idea how he managed to pack the stern gland without the proper end on the tube, but he did. 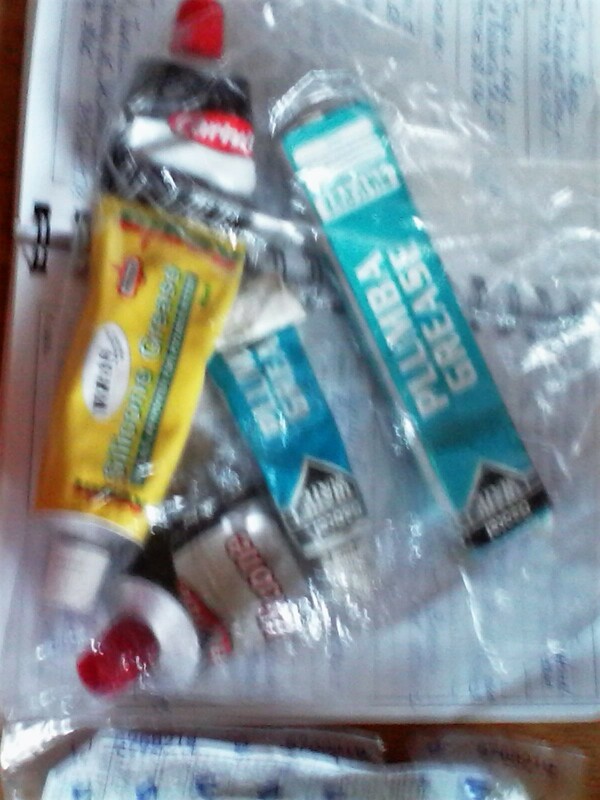 The bag I now have of various tubes of silicone grease, not good for greasing the stern gland! 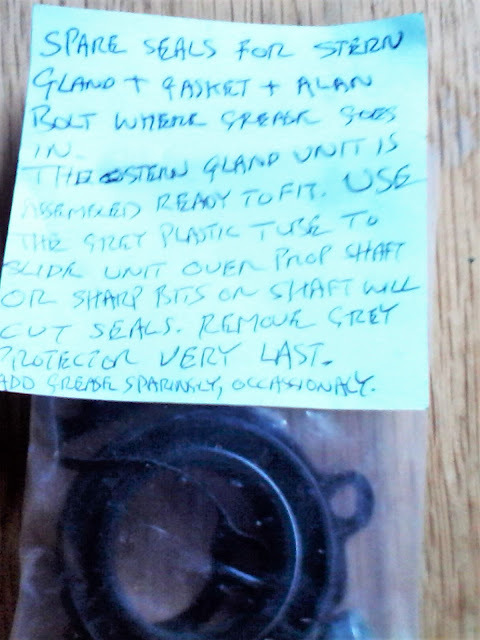 The prepared stern gland seals with a note to me from Les on how to replace them. I found it under the dinette seat among the dozens of other boxes of spare parts he squirreled away for me. I am still at Fenny Stratford and will stay through the weekend. The water point has been repaired but of course RCR didn't come until late this afternoon so I schlepped 15 gallons of water in three separate trips early this morning, adding them to what little water was still in the tank. Imagine my surprise to dip the tank and find it is now almost half full! I had more left than I thought. Of course I have not washed clothes in nearly two weeks and I have bathed in the sink and washed my hair with one pan of water heated on the stove. I washed my dishes in four inches of hot water and soap, and otherwise made 5 gallons stretch for nearly seven days! The last time we were here together was late last July. Les had went in to the Royal Free Hospital for one week in order for them to assess exactly where the cancer had metastasized and what could be done to control his pain. Many times in the three years we fought for his life, Les and I waited for trains at this stop. We have a long history with Fenny--long for us anyway. The first time we moored here together it was late May, 2011. I had flown over for three weeks to make sure living on a boat was going to work for me and us, before we returned to Pullman, Washington to get married. Les had one very large, overstuffed leather recliner which took up most of the saloon (for non-boat folks this is what you would call a front room or living room). While big, it was not large enough to accommodate both of us together. We needed to go chair shopping and I thought IKEA might be a good place to start. There is an IKEA just a twenty minute walk from here. So we fetched up here at Fenny Stratford and the next morning--an unseasonably hot spring day with brilliant sun and temperatures up in the 70's F. we set off on foot for the Swedish superstore. Les had his fixed route to the store. Of course he told me it was only a ten minute walk (anyone who knew Les well knows how he downplayed the actual length of any journey on Shank's pony! twenty minutes was always ten, and twenty five minutes was relayed as fifteen. Well this particular journey was my first on foot with Les and I had yet to learn...a lot of things. We strolled across the pedestrian bridge over Fenny Stratford lock and up Lock View Lane to Simpson Road and turned left. We crossed Simpson Road and walked over the Fenny Stratford rail station--an outdoor stop with a covered seat and a reader board. "Les where is the cross walk?" "There isn't one. These roads were made to carry automobiles quickly and efficiently and pedestrians crossing them were not a consideration." My eyebrows raised to my hairline. "So, are we going to call a Taxi to take us and the chairs back to the boat?" "Of course not. There are no cabs large enough to carry us and two large boxes." Les started off across the parking lot towards the store entrance. "Well if we aren't taking a Taxi, how are we going to get our chairs home--assuming we find any here today?" "We'll take them back in a trolley the same way we came." Les smiled smugly. "Are you out of your mind?!! We will never make it across all those lanes of traffic with a loaded trolley and no crosswalks, never mind hoiking it through the forty acre wood back there." "It'll be fine. Trust me." So off we went hand in hand and I had another first experience: discovering how indecisive Les was when faced with the need to choose something; to make up his mind and commit to something. I had no idea about the existence of this quirky facet of Les' personality since he was quite decisive in declaring his love for me and asking me to marry him! "I'm done shopping Les. This is the chair I want. Please make up your mind and let's get this over with." I am one of those female anomalies. I hate shopping! Off we went careening across two lanes, a grassy median and another two lanes. By now I was hot, sweaty, tired and thoroughly unimpressed with this idea. Sweat was beading on Les' brow and he was out of breath too. "Crikey I could use a fag right now." "I could use a fag and I don't even smoke!" Les burst out laughing and in seconds we were both cracking up, sides heaving with mirth. The boat is back up the ramp, to the left along Simpson Road and down Lock View Lane to the cut. The sheltered seat at the rail stop. I left a message in the upper right corner of the side wall above the last two holes on the top. There are so many memories along all these roads as we moored up time and again here and made our way up the streets to Tesco's for groceries, or to B & Q for varnish, or Halford's or Wickes for some bit or bob on Les' list. While waiting for NBV to be repaired I took the train to Bletchley Park. It took all of five minutes to carry me from Fenny Stratford rail stop to Bletchley station. I walked two minutes up the road and entered Bletchley Park for an intriguing day that carried me back to WWII and the infamous Code Breakers; Alan Turing, the father of modern computers, and the Bombe he helped design and create which broke the German Enigma code--every day anew. My round trip train ticket cost me all of £2.70--cheaper than taking the bus! By late afternoon the weather turned fowl, with low black clouds spitting frigid rain and eventually snow! As I disembarked at Fenny Stratford rail stop I thought back to that lovely sunny day, six years ago and I could feel Les all around me. I did something I've never done before and will hopefully be forgiven; I defaced a piece of public property by gently scratching the paint off inside the rail shelter near where Les and I sat that day back at the beginning of our life together. I didn't carve it into the metal for all time. 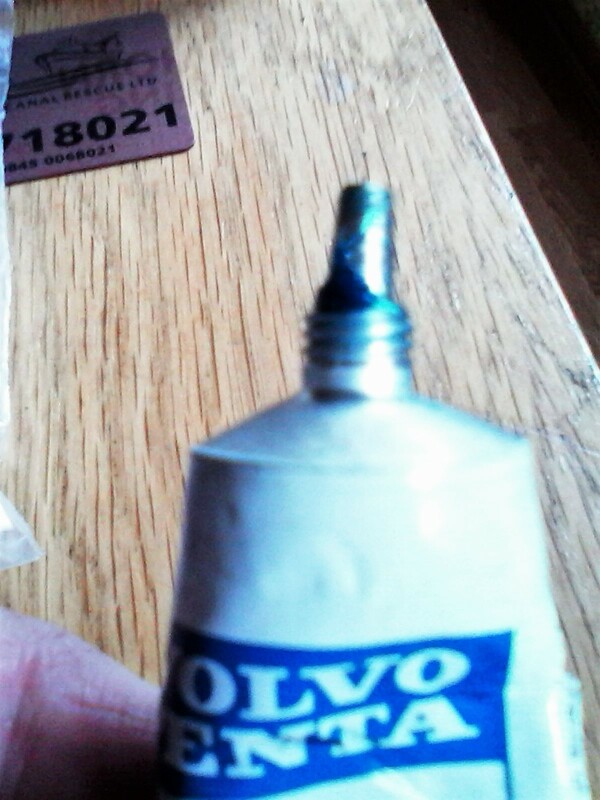 I only removed a layer of paint. The next time the Milton Keynes Council have the rail shelter painted my etching will disappear. But for now, there is a small reminder that we passed this way once upon a time and that we are soul mates forever. Along with all the other "issues" I have been dealing with over the past two weeks, last week the throat plate or baffle on the wood stove started slipping down into the fire. I used an Ikea silicone oven glove to reach in and set it back in place, thinking I would eventually get around to figuring out what was causing the throat plate to drop at some other time. I just wanted some room to breathe and not have to face yet one more thing. Alas, yesterday evening just after I got the fire going nice and hot, the bloody throat plate suddenly dropped again and I had simply had enough. I kicked the stairs, screamed at the sky and went to bed sobbing "Enough is f*****g well enough already!" I remember the last time Les replaced the fire bricks. He didn't want to use cheap vermiculite bricks so he walked into a stove shop in Leighton Buzzard and bought a set of ceramic bricks. These were not fit for purpose to our Valar Willow solid fuel stove, so Les had to measure the inside of the firebox, cut the bricks with a hand saw, cobble them together with fire cement and fit them into the stove box. This is a prime example of Les' love of tinkering and figuring out cheap, cheerful solutions and doing the work on his own. This is not even a possibility for me. I don't have the upper body strength to cut fired bricks with a hand saw. I don't have the mathematical skills to measure the inside of the firebox and extrapolate what angles to cut the brick to begin with! Crap! Crap!! Crap!!! This morning I woke at 6:25 am to a cool boat. The fire was obviously out. I opened the stove door and with flashlight (torch) in hand I poked around to discover that the fire bricks Les installed about three years ago had crumbled on the top edge. A large triangular piece was missing on the left side and the throat plate--which rests on the top edge of each brick--could not possible stay in place. As Les was well aware and other boaters have commented, I am a very driven person; however I am learning that drive without thought and good directions will NOT take one where one wants and needs to go. So I decided to let things percolate over several cups of morning coffee. I went online and downloaded the instruction manual for our stove, reviewing the directions for changing out the fire bricks. I knew Les had ordered a replacement set of fire bricks for me last August. He wrapped them in bubble wrap, labeled them and they were tucked away under the seat on his side of the dinette. I moved the upholstered cushions, pulled the heavy, ungainly lid up on the dinette seat storage and extracted the package labeled "fire bricks" in Les' familiar handwriting. I pulled the taped bubble wrap apart and found a complete set of vermiculite fire bricks made specifically for our stove with the order receipt inside detailing what they were, where Les purchased them from, and how much they cost. Goddess bless his precious soul! I proceeded to clean out the fire box with a wire brush from Les' man drawers set the brick in place and replaced the throat plate. It took me all of twenty minutes and was not difficult. I did have to look at the pictures of the throat plate in the instruction manual to get it in the right way up. It all fit together like a glove. I am sitting here with tears streaming down my face. My Best beloved is still looking after me in his way; his love for me made him think far ahead to the time I would have to cope on my own; he ordered extra parts which he labeled and stored under the dinette seats for me. With Les' help I will become self-reliant. He believed in me so I must believe in myself. New fire bricks in place with the throat plate resting properly on top. The old ceramic fire bricks on the left, and the receipt for the new ones with all the information I need to order another replacement set. Yesterday I was blessed with a short visit by Adam and Adrian on NB Briar Rose. They were on their way back northward and pulled in behind me for a cuppa and a natter. Thanks guys! It was as always lovely to see you and spend a bit of time chatting. Thank you for your hugs and kindness. This morning a boat moored up behind me with two young women on it. They are partners and I was chuffed to bits to meet them. It is wonderful to see young women living aboard and cruising the cut, reaching for this lovely life and making it theirs.